Sacramento, California – Anthony Perez had just returned home from work and was watching a Rockets and Warriors game on TV, May 26, 2018 at around 7:45 in the evening. Suddenly loud stomping, with shouts and yelling in Spanish erupted from upstairs. His neighbor, Raul, came up to the window and told him that another neighbor had “beef” with him. Anthony had only seen the man twice and had no idea what the problem could be. As the yelling in Spanish continued, Anthony reflexively picked up his revolver off the coffee table, put it in his pocket (in a holster), walked to the front door and hit “record” on his cell phone. 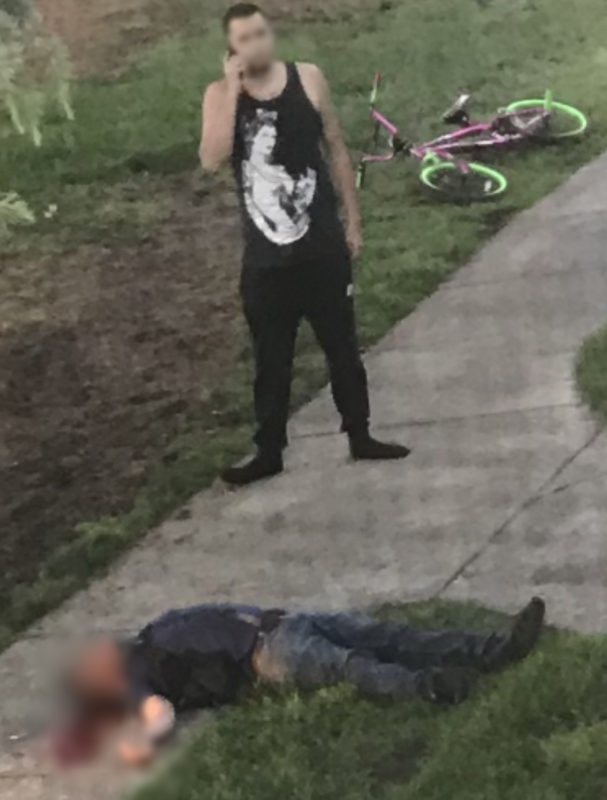 Anthony’s friend Raul was trying to help with the translation, because the man, later identified as Sergio Minero Escobedo, 39, was yelling in Spanish, “F’ing Dog” (Puto Perro) repeatedly. Escobedo appeared to not speak English. Anthony Perez has been a door to door salesman, and knows well the energy being emitted from people. Anthony told us he’s not normally a “confrontational” person. And he is well aware of how California feels about guns. He realized there would be no reasoning with the suspect. He steeled himself for a fist fight that might be coming. He had no idea what the man was about to do. Anthony is 6’2″; the suspect was around 5’8″ and Anthony figured a fist fight wouldn’t last long. So he placed his phone on a table outside, but it kept recording. That was a fortuitous action. Suddenly, Escobedo jerked a .380 out of a pouch in his backpack, racked a round into the chamber, cocked it, and pointed it at Anthony’s head. Anthony doesn’t generally keep a round in the chamber of his semi-automatic firearm, so that he had a Smith and Wesson 442 (called an “airweight” .38) revolver was also fortuitous. Anthony kept his eyes locked with the suspect, and carefully reached into his pocket, unsnapped the holster, praying the man wouldn’t notice his movement. He gripped his weapon tightly, with thoughts racing through his head. He yanked out the gun and shot three times. He only clearly remembers the last shot. Police later told him that he hit Escobedo once under the chin, one in the mouth, and one in the temple. The threat was eliminated. Anthony immediately called police and told them what happened. When they arrived, along with Crime Scene Investigators, he told them to check his phone. The first officer on scene was a rookie who removed the round that the suspect had in the chamber (which would have deleted the self defense part of Anthony’s story). Fortunately, Anthony’s cell phone video and audio made the self defense issue extremely clear (it is not in a format compatible with this website). Police left him sitting in the patrol car for 4 hours, and then removed him to an interview room at the station for longer. CSI stripped him of his clothing and took samples of DNA. It was only after he signed a release for the Prosecutor to look at his cell phone that they realized it was clearly self-defense. He was released with no charges after police took his weapon and a full, unopened box of ammunition. They told him he’d get it back in “6 to 8” months. As of this writing, it has not been returned. Anthony was finally able to move from that apartment in a not-so-good neighborhood just a few weeks ago. He never intended or desired to take a man’s life, nor did he ever want to be called a hero. He was in therapy for some time, which helped him cope with the feelings that caused him to snap at his family and girlfriend. Muay Thai and his Church also help him cope. I am commission only so if I don’t work I don’t eat and I wasn’t able to work for 4-5 months. I was sleeping in motels with my dog because I was scared to go back. I didn’t want to go to my girlfriend’s house because she has a young child and I didn’t want to put them in danger. I constantly worry when I’m in public – that happened in what was supposed to be the “comforts of my own home.” I would drink everyday while battling depression, but was able to finally escape that with Muay Thai in September. All of my savings are gone and I’m trying to catch up on bills but it’s hard to still work at my full potential. I do feel there’s a light at the end of the tunnel though and I love my job saving people money by going solar. My company has been super supportive. Been doing it for 6 years now. I still suffer from PTSD but Muay Thai is a huge help. At the end of the day, I’m just happy to be alive. He was never given any information about the man who died. He heard that someone stole $15,000 worth of belt buckles from the man’s apartment after the incident. Belt buckles have sometimes been part of the “fashion statement” of certain drug cartels. There had been a history of violent outbursts at the apartment where Escobedo resided, as well as numerous nights of disruptions from some sort of “machine” that kept residents awake. Adding that to frequent yelling and stomping, the apartment dwellers were all concerned that something “shady” was going on. We have learned that Sergio Minero Escobedo had five children and a wife, who claims that she stills struggles with his death “by gun violence.” Escobedo’s father came up from Mexico and took his son’s remains back with him. Was Escobedo a mule for the cartels? Was he abusing his wife and children? Was he an illegal alien? These are questions that will likely never be answered. The news media did not cover the story, probably because self-defense was not what they wanted to report. The only station that even did a preliminary story was a local Sacramento Fox affiliate. Anthony Perez could easily have been killed in the blink of an eye. But because he was armed and knew how to defend himself, he survived. He did the right thing.